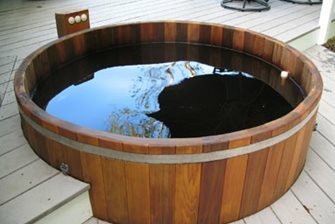 A conventional cedar hot tub set into a deck. 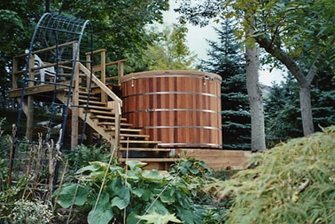 A deep cedar hot tub designed for therapy and exercise. 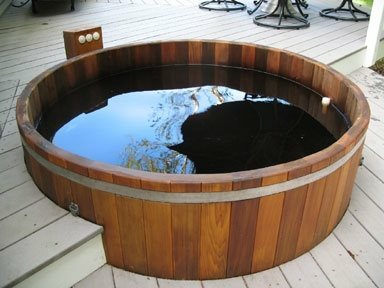 A wood-fired cedar tub with submersible stove. Even though the Summer of Love is behind us, many Americans still carry a bit of the hippie mentality. If this is you, we suggest getting an all-natural cedar hot tub. 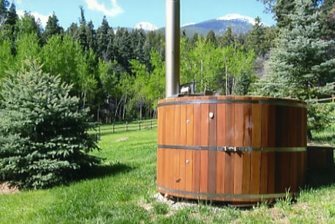 Why is a cedar hot tub perfect for former hippies? Because it provides a communal experience, is countercultural and brings you to a state of relaxation. 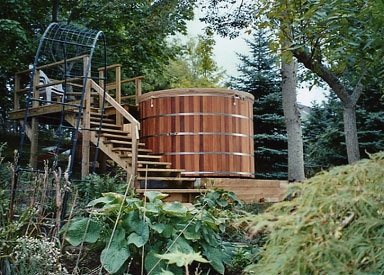 All tubs from Maine Cedar Hot Tubs are made from top-grade cedar. Ideal for hot tubs, cedar is decay resistant, has a sweet aroma and beautiful grain pattern, is smooth and splinter-less, is self-sealing and an excellent insulator. You can choose between stainless steel, copper or bronze tension bands. The company offers three standard tub lines. Their conventional cedar tubs and spas are heated with electricity, gas or oil and are available in free-standing or deck-integrated models. Features such as hydrotherapy jets, air injection systems and lights are available. Their exercise and therapy units are wide and deep enough for water aerobics. And finally, their wood-fired models, which are heated by a submersible stove, are great for remote locations. All tubs are available in a variety of sizes and crafted with the finest materials. So, throw on some folk music and take a dip in a cedar hot tub, its sure to be an experience you won't forget.